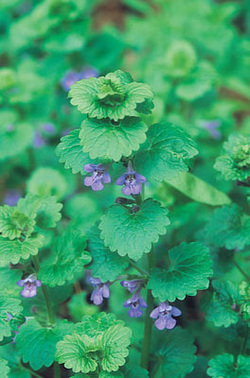 The four-sided stem of the Creeping Charlie (Glechoma hederacea) and the aromatic odor it gives out when crushed or cut is indicative of a member of the mint family. Like many others in the mint family it spreads by creeping both above and below the ground. Although it is now treated as a persistent, irritating weed, Creeping Charlie, like so many weeds, was intentionally brought to the New World by Europeans. Also, like so many other weeds, Europeans used Creeping Charlie as a salad green, cooked as an early spring green, as a tea and as a medicinal remedy for a variety of ailments. To the Europeans Creeping Charlie with its dense growth and bluish purple flowers was also seen as an attractive ground cover or potted plant. Creeping Charlie has even been used as a substitute for animal rennet when making cheese. Creeping Charlie is native to Europe and southwest Asia and from the time of ancient Greece it has been used as a remedy for problems such as inflamed eyes, ringing in the ears, indigestion and problems of the gastrointestinal tract, kidney diseases and urinary tract issues, general fever and flu. It has also been used for colds as an expectorant to relieve congestion and coughs and to treat bronchitis. Like other herbs widely used throughout history, Creeping Charlie has acquired many monikers in various geographical locations related to its use or appearance. 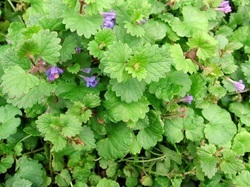 Besides “Creeping Charlie” this plant is commonly called as ground-ivy, because of its resemblance to ivy; "catsfoot" because its leaves are the size and shape of a kitten's paw; field balm because of it’s medicinal uses and aroma; and run-away-robin because of its tendency to spread. Until the time of of Henry the VIII and the introduction of hops, Creeping Charlie was used in making beer. It was called guiller in France which meant ‘fermenting beer.’ This morphed into “gill-over-the-ground.” Since “gill” was also used to refer to a girl that is probably where the name of ‘Hedgemaids’ originated. Alehoof and tunhoof are names that also arose from being used in the brewing of beer. Hoof is an old English word for herb and a “tun” is a large cask used for fermenting liquids. Even though it has been used as food or medicinally in the past there are some disclaimers. The oils in the leaves are toxic to horses and cattle. Fortunately, they generally do not like the bitter taste and will avoid it unless nothing else is available or if they are fed hay made from an area with lots of Creeping Charlie. It is also poisonous to cats. Pulegone, the oil found in Creeping Charlie that causes the aroma, is now known to be an irritant, toxic to the liver, and an abortifacient. In a bulletin posted February 7, 2014, the California Environmental Protection Agency’s Office of Environmental Health Hazard Assessment announced a notice of intent to list pulegone as known to the state of California to cause cancer. However, a person would have to eat copious amounts of Creeping Charlie amounts before it would affect them. As with any herb (or any food, for that matter), moderation is a good idea. Creeping Charlie thrives in moist, fertile soil in shade but it will also tolerate sunshine and dry, poor soil…it’s hard to kill as anyone who’s tried to remove it will attest. It is a spreading perennial and will overrun grass and other plants and will even grow through mulch. There are many ways to deal with Creeping Charlie with differing degrees of success. Some people used an herbicide such as Roundup, but herbicides are not completely effective because of its rambling nature. Most herbicides do not get distributed throughout the entire plant, and there is only a partial dieback, never complete elimination. Furthermore, care must be taken not to spray surrounding grass and foliage. Others prefer Borax as a more natural solution. Borax contains boron which will kill Creeping Charlie if it is in the soil in high concentrations. The problem is that too much boron in the soil will also kill other plants. In addition, boron is an element and therefore doesn't break down in the soil and may contaminate the soil and groundwater for seasons to come. Pulling Creeping Charlie is an endless task because any piece of the plant left behind in or on the soil will root, grow into a new plant and continue to spread. Another suggestion is to smother it. Cover the area with newspaper, cardboard or even black plastic and leave it until the plants are all dead. This is pretty drastic and needs to be immediately followed up by replanting grass in the area because the open area of soil is an invitation for all kinds of weeds. Bottom line: You might want to just ignore Creeping Charlie. It’s not useful as a food or medicine -- it won’t kill you to drink a tea made of Creeping Charlie but there are many other better herbal teas and salad greens and much better medications available. Creeping Charlie may be one of those weeds it’s just best to learn to tolerate unless you have a lot of time on your hands and no other yard and garden issues that are more pressing. 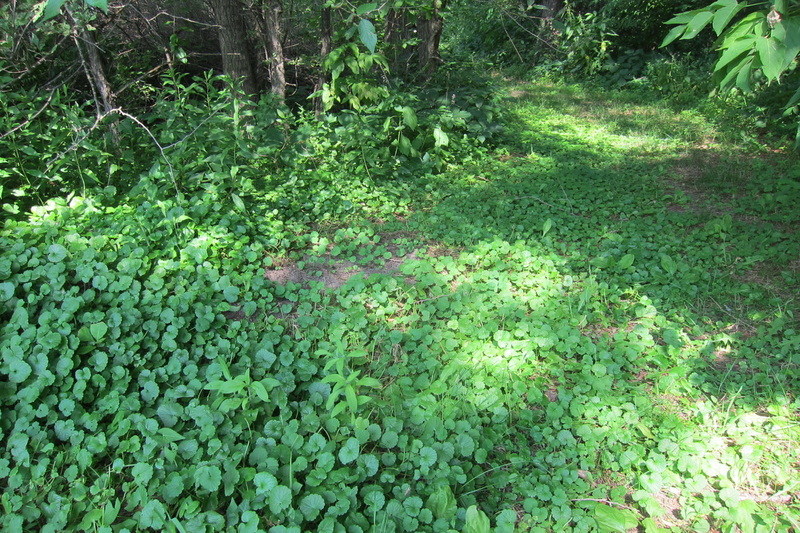 It might be even be a useful ground cover in shady areas where grass struggles to grow.